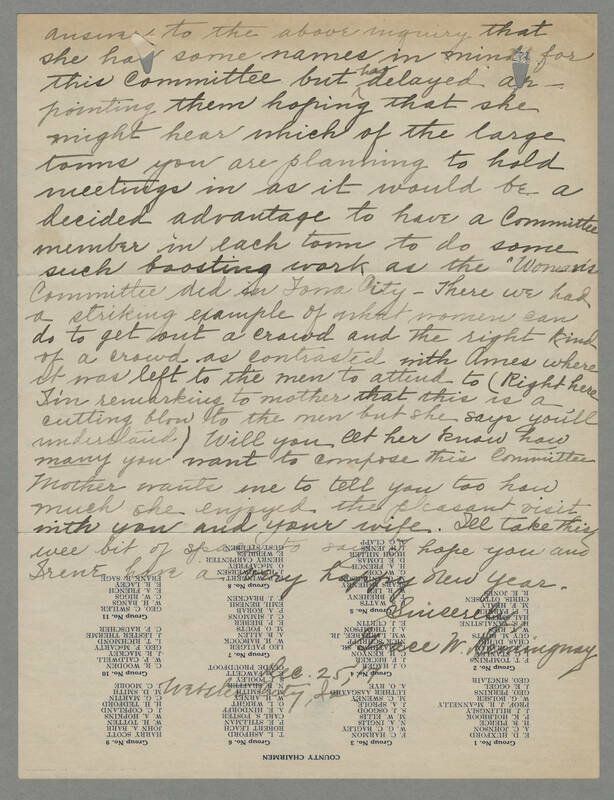 answer to the above inquiry that she has some names in mind for this committee but has delayed appointing them hoping that she might hear which of the large towns you are planning to hold meetings in as it would be a decided advantage to have a Committee member in each town to do some such boosting work as the "Women's Committee did in Iowa City. There we had a striking example of what women can do to get out a crowd and the right kind of a crowd as contrasted with Ames where it was left to the men to attend to (Right here I'm remarking to mother that this is a cutting blow to the men but she says you'll understand.) Will you let her know how many you want to compose this committee. Mother wants me to tell you too how much she enjoyed the pleasant visit with you and your wife. I'll take this wee bit of space to say I hope you and Irene have a very happy New Year. Sincerely, Grace W. Hemingway Dec. 25, '17 Webster City, Ia.